Earlier in the year I had entered 3 wildlife images into the BWPA competition. Then came the call to say my work had been shortlisted for inclusion into their exhibition at the Hoopers Gallery. Fortunately We were a going to be meeting up with my cousins Andrea and husband Tremayn from Canada and cousin Trevor and wife Linda from Hackney! We spent the afternoon catching up over a long lunch near Covent Garden before hopping on a bus to the gallery. 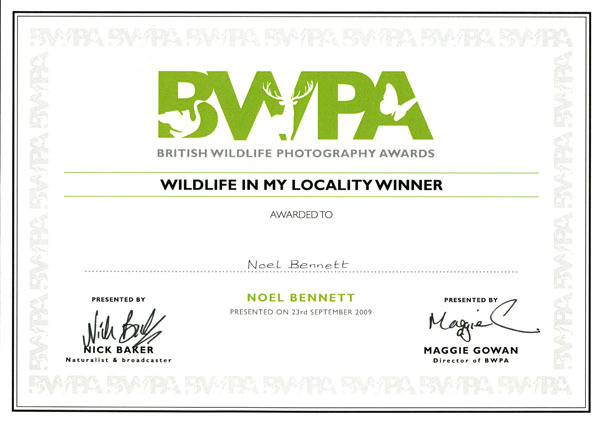 I am pleased to report my image 'Serenity' scooped one of the 7 categories 'Wildlife in my Locality'. Presentation by Nick Backer (naturalist and broadcaster). We met several interesting people while enjoying the whole show. Hoopers (photography) Gallery 15 Clerkenwell Close, EC1R 0AA. You can visit the exhibition until 16.10.09.